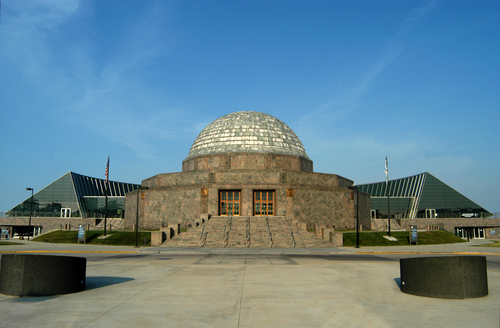 The Adler Planetarium in Chicago, site of some amazing astronomy fun. Photo credit: Adlerplanetarium.org. Science blogging, space visualization, and… improv lessons? Welcome to the KICP Education and Outreach Summer School. I’m here with my fellow Astrobiter Elisabeth Newton and a cadre of other astronomy grad students. We’re working with outreach professionals from the University of Chicago, the Field Museum, the Adler Planetarium, and yes, even improv professionals from the Alan Alda Center for Science Communication, all to learn how to be better at astronomy outreach. For those of you who might already be tuning out (“This isn’t my daily paper summary!”), I have this to say: science is pointless if it is not communicated. Whether that’s writing a journal article, going to a conference, talking to the media, chatting over coffee with your colleagues, or explaining your job to a stranger while you’re waiting for the bus, you have to share your science, or what was the point in doing it at all? The skills we learn for outreach—how to communicate clearly and use the best avenues for that communication—are the same ones you need to be an effective scientist. I would also argue that they make you a more effective person, whether you choose to do research, teaching, industry, or leave STEM altogether. I’m personally interested in education and public outreach (EPO) as a full-time career, but EPO is important to full-time researchers as well. All NSF proposals demand some sort of broader impact. Beyond that, almost all our research in astronomy is funded through taxpayer money, and it’s only fair to make our findings available and understandable to those who made it possible. There’s a growing demand for professors who are actually good communicators and teachers (any current student can see the benefit in this). And many universities support outreach into their communities, whether that’s public observing, science days, or sending grad students and professors into schools and community centers. I personally feel a very strong sense of social responsibility to use my experience and knowledge to extend science literacy to populations that are traditionally underserved. Plus outreach is just plain fun! My point is, whatever career path you see yourself on, learning how to be a better science communicator is always a plus. We’ve spent the first few days of the summer school learning a bit of everything! We’ve gotten to hang out with Emily Graslie of The Brain Scoop to chat about video blogging, and meet the teams behind The World Wide Telescope and the Adler’s Space Visualization Lab to learn about some truly mind-blowing astronomy visualization software (trust me guys, the future is here). We’ve played with science labs like we were summer space explorers, and talked with post-docs and professionals from all these projects and more. In the days to come, we’ll break into smaller groups to do some in-depth, hands-on work with some of the above activities. 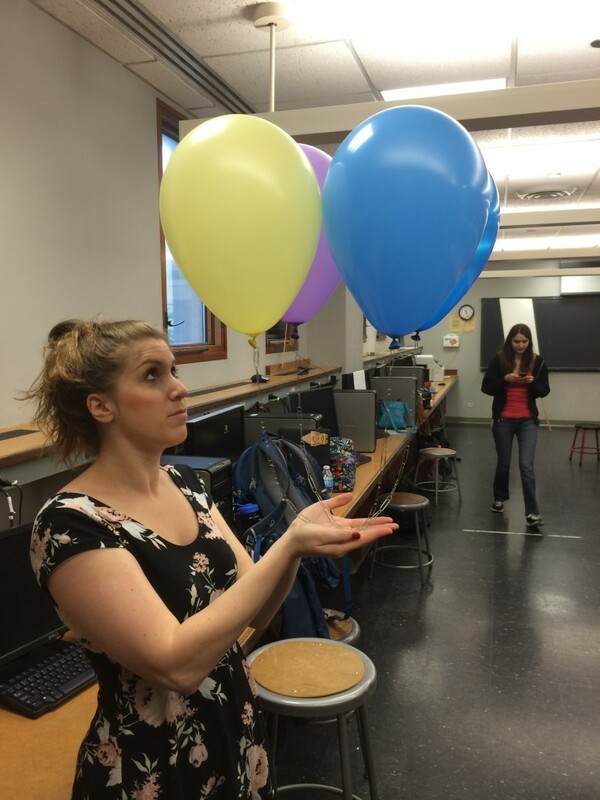 Participating in a lab about buoyancy or playing with balloons? It’s pretty much the same thing. Photo credit: Aaron Lee. Some of us will learn technical skills associated with the more software-based outreach projects. Some of us will be focusing more on curriculum design and the planning behind projects. But all of us will be honing the skills we learned the first day in our improv lessons: Know your audience. Lead with the good stuff. Pay more attention to your audience than yourself. As scientists, we often get lost in our own heads about what we want to say and exactly how we need to say it. There are times to be exceedingly specific and accurate—for instance, when you’re writing a journal article. But maybe you can sacrifice a few details (even though it’s the only thing that makes your work original! ), and add some colorful metaphors when you’re explaining what you do to Aunt Elsa at your next family reunion. I personally will be spending my time developing curricula for Space Explorers, a week-long summer workshop run at Yerkes Observatory that takes Chicago high school kids and gives them full days of science labs and nights to use the telescopes. This program feeds into a schoolyear program that lasts throughout their high school careers, and has had great impacts on their journeys to college and beyond. I find out exactly what I’m doing with this group today, so wish me luck! For those of you who want to learn more about outreach but couldn’t be here with us, never fear! We have a page of resources that is being updated as we progress through the week, so keep an eye on it.